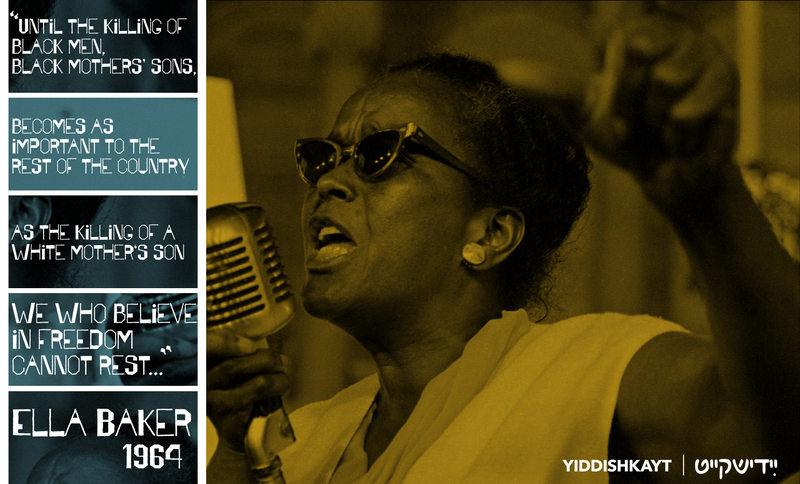 The month of November,with its transition from golden, autumnal plenty to the darkness of barren winter, has served as inspiration for a number of Yiddish poets. To mark the ending of this last month of commemorations happy and solemn, past and present, real and imagined, we present poems by Berish Weinstein (1905-1970), Aaron Glanz-Leyeles (1889-1966), and Itsik Manger (1901-1969). The recent events in Ferguson, Missouri culminating in the 24 November decision of the grand jury not to indict Darren Wilson for the killing of 18-year-old Michael Brown, make the 50-year-old words of civil rights activist Ella Rogers ring as true as ever — especially as the verdict fell on the same day Andrew Goodman, Michael Schwerner and James Chaney received posthumous Presidential Medal of Freedom. Echoing to us along with Rogers’ words are those of American Yiddish poet Berish Weinstein, in his early-1940s reflection on the promise and disillusion of urban America. to sing the song of your land. So many sad streets on your soil, America! One can see how lonely people can be on your soil. Ships sail on your dusky, stooped waters. the wood off the shores. Gloomily, watchmen pace among your foreign wares. Evening docks – murky and drunken with fog. And talk to emptied beer mugs with dribbling mouths. It is as if he died in many countries at once! צו זינגן דאָס געזאַנג פֿון דײַן לאַנד. אַזוי פֿילֹ טרויעריקע גאַסן זײַנען אויף דײַן ערד, אַמעריקע, פֿאַראַן! קען מען זען ווי עלנט עס קענען זײַן מענטשן אויף דײַן ערד. זעגלען די שיפֿן אויף דײַנע אָוונטיקע, געבויגענע וואַסערן. און שאַרן פֿון זיך פֿלאַמיקן שוים. טרייסלען ס׳געהילץ פֿון די ברעגן. סמוטנע גייען וועכטערס אַרום איבער דײַנע אויסלענדישע סחורות. אָוונטיקע באָרטנס — וואָס זײַנען פֿון נעפּלען שיכּור און טריב. קום רעדן צו די אויסגעוועפּטע ביר-גלעזער, מיט צעגאָסענע מיילער. איז ווי ר׳וואָלט דאָ געשטאָרבן אין אַ סך לענדער מיט אַמאָל! 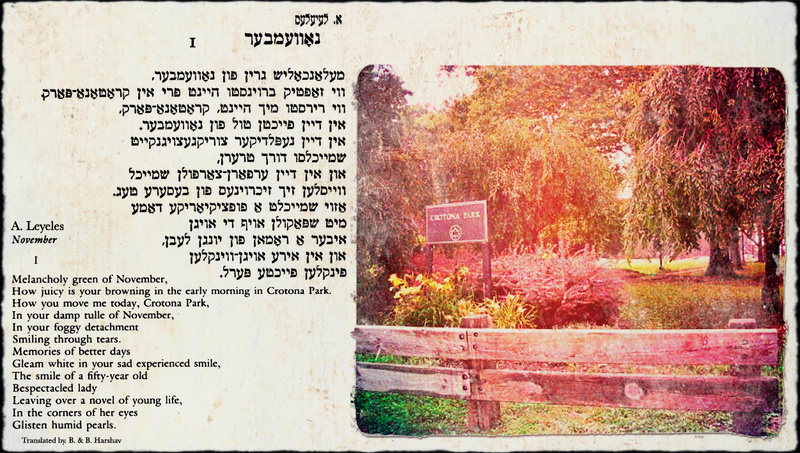 Aaron Glants-Leyeles’s poem “November” is shaded with deep nostalgia, as he describes a scene in Crotona Park in the Bronx, a popular meeting place for Leyeles’s generation of New York Yiddish poets. In Itsik Manger’s take on November, the month is a time of dark foreboding, abandonment, and loss, yet it also possesses a coherent, Gothic beauty. 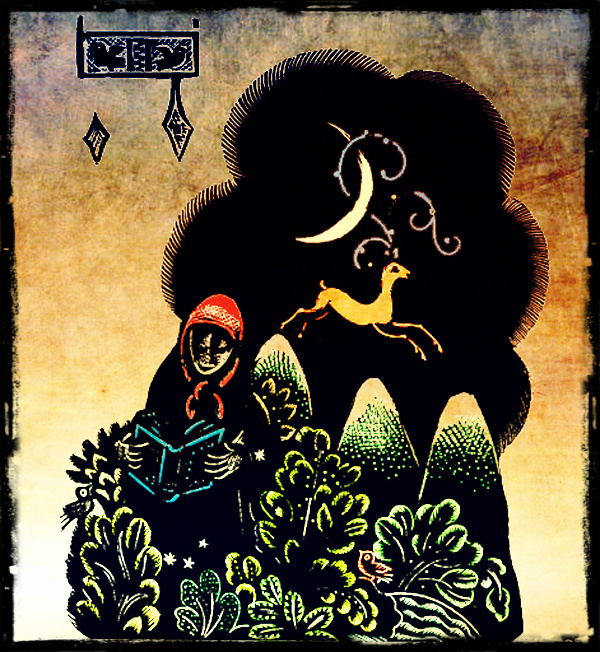 We should all be so lucky as to have an Anyela who will wait out these strange seasons with us. All through the town, the clocks begin their ringing. My body, here beside you, burns, Anyela. Listen. How beautifully sick owls are singing. The graves are young and ready, and they wait. White music on the throats of pious calves. A guiltless sacrifice of lullabies. And they suspect the proof of their old eyes. His lamp and asks, “Art thou my destiny? That only lately fell out of the sky. Deserted wives, at stations, await their men. And feel about, but only touch cold rain. and twitch. Upon the wall, his shadow burns. And gets no answer he can understand. ?וווּ ביסטו גאָלדענער, וווּ ביסטו שענסטער? Previous PostPete Seeger sings "Khanike, Oy Khanike"